EAA AirVenture 2018 is now in the history books, but by all accounts it was huge success! The event was attended by airpark residents Jon Middleton, Gary Towner, Larry & Jennifer Driver and their granddaughter Lindsay, Jeff Davidson, Jack Lawless and Larry Cranton. In addition, our two latest scholarship recipients, Julia Reidhead and Matthew Robinson, were in Oshkosh attending the EAA Air Academy and were able to take in all the excitement that is AirVenture. 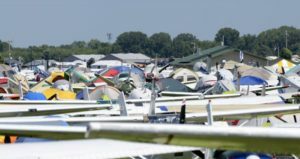 Next year’s AirVenture will be July 21-28. We hope to see you there! You can read more about this truly incredible yearly event by clicking here. The statistics are sure to amaze!